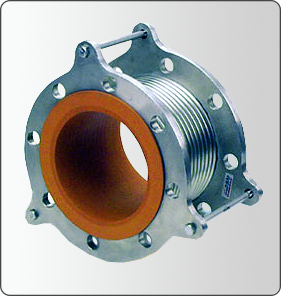 SILOFLEX®-lined FJR expansion joints/pump connectors combine the sound and vibration dampening qualities of silicone rubber with the high pressure and long cycle life qualities of stainless steel. This unique silicone lined connector/expansion joint compensates for axial, lateral and angular movement, while absorbing equipment and pipeline noises and stresses. The SILOFLEX® liner of the FJR protects the entire wetted surface, reducing the friction loss and turbulence normally seen in a corrugated expansion joint. The liner also insulates and protects the bellows, while preventing debris collection. These piping expansion, movement and vibration "Problem Solvers" are in service in dairies, breweries, and food manufacturing facilities.